Online learning provides you the ability to take an educational course in the comfort and convenience of your own home at your own pace and is a perfect option for eager students who are unable to travel, or can’t afford to attend a class or school in person. Not only has the Internet revolution changed how I do my work and teach my hypnosis courses, it has transformed the ability to access information and the possibilities for further education in all areas of life. As we have seen in recent years, especially since the beginning of the new millennium, technology has reshaped our world in profound ways. When I think back to what it was like when I began working in this field in 1968 it must be hard for young people to imagine how difficult it was just to do basic research. For example, the first time my late husband Johnny and I regressed a subject into a past life, it was up to me to take notes so I could write to historical societies, government agencies and professional directories to try to confirm if a name, place or event revealed in the sessions was a verifiable fact in the public record. It could take weeks or months just to get an answer or reply and more often that not the records were incomplete. 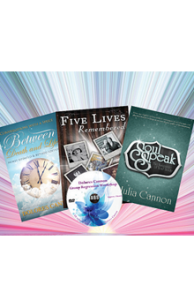 Now, after developing and practicing my technique of hypnosis and past life regression for over 40 years, it is exciting to be able to reach and teach more people through my online hypnosis courses than ever before. I could never have dreamed this would even be possible all those years ago except for the information coming through many of my sessions that spoke of the amazing advances that technology would bring to our world during this pivotal time in human history. To be able to share the ability to help people in need is an honor and a vital part of my work to disseminate lost knowledge as human consciousness continues to evolve. With widespread access to the Internet around the world, more students than ever will be able to take my hypnosis courses and expand their awareness wherever they are.